MOSCOW, March 2. /TASS/. The Russian Ministry of Energy believes that no grounds are in place so far for resumption of trilateral talks among Russia, Ukraine and the European Union on gas supplies. Nevertheless, such an opportunity is present, Russian Energy Minister Alexander Novak told reporters on Friday. "They have not been held for a long time. I do not know whether they are needed or whether they take place. No grounds are present so far. Contracts are in place; [the parties] can negotiate supplementary agreements if they want," Novak said. The Stockholm arbitration bound Gazprom to pay $2.56 mln under the transit contract with Naftogaz of Ukraine for short supply of gas on February 28. 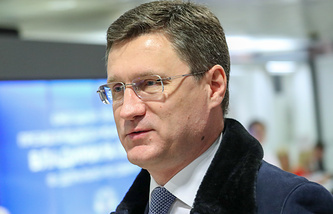 Gazprom expressed disagreement with such decision and announced its intention to defend its rights by means available with it under current laws. Gazprom returned the payment for March deliveries of gas to Naftogaz and said that it would not start it because of missing agreed supplement to the effective contract. CEO of Naftogaz Andrei Kobolev viewed it as Gazprom’s refusal to perform the court decision. He also informed about the gas deficit in Ukraine because of lack of supplies from Russia and the need to limit fuel consumption from March 6. Vice President of the European Commission Maros Sefcovic calls upon the parties to return to the trilateral forum. Minister Novak said in his turn that he is ready to discuss gas supplies to Ukraine with the EC. The last trilateral meeting among Russia, the European Union and Ukraine was held in December 2016, where Russian gas supplies to Ukraine and transit to the EU were discussed. The meeting did not end with practical agreements.